In order to ensure that export of Indian handicrafts from Assam’s Bodoland Territorial Council (BTC) to Bhutan continues, a Memorandum of Understanding (MoU) was also signed with the Bhutan Chambers of Commerce and Industry (BCCI), Royal Government of Bhutan on August 17, 2018 at Phuentsholing in Bhutan. The MoU was signed by NN Rana Patgiri, Managing Director, BRAWFED and Chandra B Chhetri, Deputy Secretary General, BCCI in presence of the Chairman, BRAWFED. 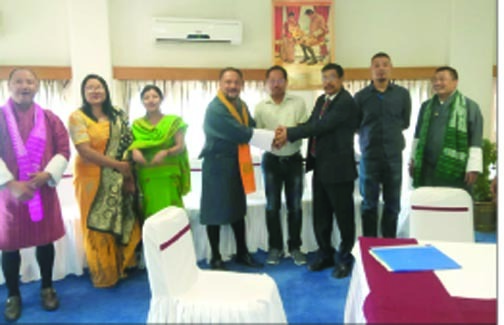 Sangay Dorji, Regional Secretary, Regional Office of BCCI, Phuentsholing and S. Basumatary, In-charge Secretary, BRAWFED, Kokrajhar also graced the MoS signing ceremony. During the programme, the issue of organizing the 7th Thematic Exhibition on Indian Handicrafts (TEIH) in Thimphu jointly with the BCCI from September 12 to September 16, 2018 was also discussed at length by acknowledging and appreciating each other’s mandated role and competencies. The exhibition is sponsored by the Development Commissioner (Handicrafts), Ministry of Textiles, Government of India, New Delhi. Since both BRAWFED and BCCI have several programmes lined-up already during the remaining quarter of the year, the partners resolved to organize the 7th Thematic Exhibition on Indian Handicrafts parallel with the Bhutan-India Trade & Investment Promotion Expo and the 4th Agri-Flori Fair 2018 in commemoration of the Golden Jubilee of Formal Diplomatic Relations between Bhutan-India 1968-2018 under separate pavilions. It was decided to schedule the exhibition from September 12 to September 16, 2018 (5-day event) at the Changlimithang National Stadium Parking Ground, Thimphu. The events would be launched simultaneously on September 12, 2018 and the entire ceremonial launching function would be held at a common venue/stage built for the purpose within the event venue. To portray the rich culture and traditions of both countries and to add on the aesthetic beauty to the venue, the BRAWFED would field designers from India in advance to take care of the Indian traditional aspects and similarly the BCCI would arrange suitable person(s) to oversee the Bhutanese traditional aspects. The 7th TEIH will have 40 standard stalls with a platform for live demonstration with Octonorm partitioning for live demonstrations by master craftsperson from the BTC and space for thematic display of Indian handicrafts. BRAWFED will also hold ‘B2B’ meeting during the 7th TEIH as a market promotional programme and BCCI shall invite local buyers/stakeholders from Thimphu. The marketing of the 7th TEIH among potential Indian participants shall be undertaken entirely by the BRAWFED.